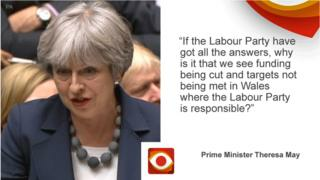 The claim: In this week’s Prime Minister’s Questions, Theresa May said health funding in Wales was being cut and targets not being met. Verdict: There have been cuts in the past, but funding has increased in real terms every year since 2013. Targets are not being met, but neither are they being met in England. Responding to Labour leader Jeremy Corbyn’s criticism of the government’s handling of winter pressures on the NHS in England, Theresa May attempted to turn the tables. “If the Labour Party have got all the answers, why is it that we see funding being cut and targets not being met in Wales, where the Labour Party is responsible?” she asked. Health is a devolved responsibility of the Labour-led Welsh government which, like its counterpart in Westminster, has been criticised over both funding and management. Between 2009-10 and 2012-13, health spending was cut in real terms by about 3.6% in Wales. The prime minister was correct to state that targets are not being met in Wales. Wales is performing worse than England at hitting the target of admitting, transferring or discharging patients within four hours of arriving in accident and emergency units. But on other key procedures such as heart bypasses and kidney transplants, the waits were shorter. Cancer diagnoses were similar in the two countries.